Endemic to Lake Malawi where it’s known only from the south-west of the lake around the Maleri Islands, Chidunga Rocks, Mumbo Island and Namalenje Island. It inhabits the so-called intermediate zones, where rocky shores give way to open expanses of sand with scattered rocks. Females and juveniles can often be found in loose, foraging groups while males form their territories between rocks, with the boundary marked by a shallow lip of sand. Minimum base dimensions of 120 ∗ 45 cm or equivalent are recommended unless keeping the fish in smaller aquaria for breeding purposes. Not as peaceful as some of its congeners and males tend to react aggressively any fish with a similar colour pattern, in particular, so take care when selecting tankmates. Possibilities could include differently-patterened? Copadichromis? or? 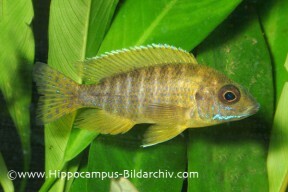 Placidochromis,? Otopharynx lithobates? and quieter Mbuna such as? Labidochromis caeruleus.? Other? Aulonocara? species are best avoided as most are able to hybridise, however, and the majority of Mbuna are excessively boisterous. It remains unclear whether this fish represents an? as yet undescribed species or not but in either case the unofficial, vernacular name is confusing due to it being based on that of a described taxon. As a result it is often referred to as A. stuartgranti ‘Maleri’ or ‘Maleri Islands’, either through error or because some authors believe it to be conspecific with A. stuartgranti. The population from the Maleri Islands is traded as ‘yellow regal peacock’ (not to be confused with the ‘new yellow regal peacock’, i.e.,? A. baenschi) and the one from Chidunga Rocks as ‘sunshine peacock’ or ‘orange peacock’, with other trade names including A. stuartgranti ‘Maleri gold’. Selectively-bred, ornamental strains include A. ‘sp. German red’ and A. ‘sp. rubescens’. It’s similar in appearance to A. baenschi but possesses a noticeably straighter (vs. convex) head and snout profile, plus relatively smaller eyes.